Hello again. I’ve not written since I was in South America. I was enjoying my last couple weeks there and then despite my imagining getting caught up on blogs (and videos) while at home, I did no such thing. I returned to the US just over a month ago and spent close to 3 weeks in VA, enjoying time with family and friends. I’ll get around to writing a post on the rest of South America, but I’m going a bit out of order first. The last time I wrote, I eluded to starting a new job this summer. I start training to be a tour guide on Monday with a company based out of Santa Rosa, CA. The tours will be focused on national parks and cities across the US, doing a mix of camping and staying in hotels. I’ll be the only tour guide as well as the driver of a 15 passenger van. Watch out. My mom and I decided to do a road trip before I started training, so on June 9 we flew out to Seattle. I got to see my friend Emma for a bit then we spent two nights in Issaquah with my aunts Maggie and Katie. On Friday we did a nearby hike and then Saturday the four of us set out for the Oregon coast. My aunt Maggie found a great little cottage that we stayed in for two nights in Rockaway, not far from Cannon Beach. On the way down he hiked in Ecola State Park (on National Trails Day!) then Sunday hiked in Oswald West State Park before spending the rest of the afternoon at Cannon. On Monday my aunts Katie and Maggie returned to Issaquah, and my mom and I continued on our trip. We hiked Neahkahnie mountain in Oswald West then drove down to Depoe Bay. Tuesday we spotted two grey whales from Depoe Bay and explored tide pools around Otter Rock and Devil’s Punchbowl then stayed in Coos Bay. The next day we did a beautiful coastal hike along Cape Arago and then stayed in the quaint little town of Port Orford. 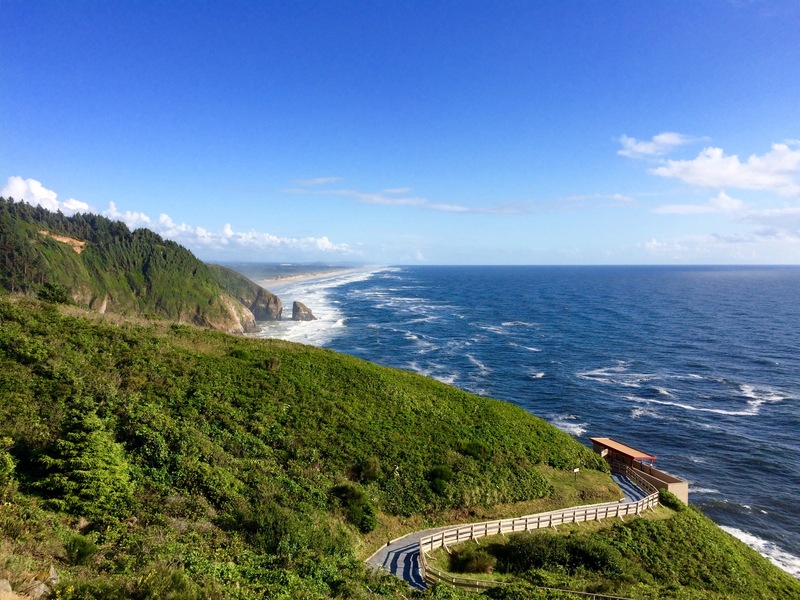 Thursday before crossing into California, we enjoyed the best coastal views of the entire trip on the southern Oregon coast. Then we explored a couple trails in Redwood National Park before ending in Eureka for the night. On Friday we drove down Avenue of the Giants through a bunch of Redwood forest which was stunning. Then we did a short hike in King Range – thinking we’d do one trail but turns out it’s only accessible with a 4×4. The hike we did do, we weren’t even sure if we reached the summit since the description mentioned panoramic views and we could only see back into the mountains. It was still pretty though. Then we arrived just in time for sunset in Mendocino, where I’ve decided that if I live in California it’s going to be somewhere around there. That whole area is breathtaking. Saturday we backtracked slightly to go to Fort Bragg to explore Glass Beach then headed inland towards wine country. We stopped at two wineries on our way into Guerneville, one of which we visited when we were here 2 years ago. We also ate at one of the restaurants we ate at last time – Boon eat + drink. Super good. Today we’ll make our way over to Santa Rosa since I start training in the morning. Hopefully we’ll get a canoe or kayak in on the Russian River before leaving!